What are the advantages & disadvantages of Partial Dentures ? Partial dentures or false teeth are usually made of acrylic ( plastic ) or a metal alloy. The partial denture as can be seen on the photos is retained in the mouth by means of suction, clips or small metal clasps. Partial dentures are used to replace a single tooth or a number of teeth hence why they are called partial denture. 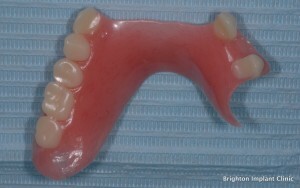 If all teeth are missing in one arch a ‘full’ denture is used to replace all of the missing teeth. Partial dentures are also known as removable partial dentures as they are designed so that the user is able to remove the denture on their own without the need of a dental professional. A single partial denture can replace a single tooth or multiple teeth. It can be made in made in a single day, in as little as 4-8 hours. Our in house dental implants laboratory is able to make partial dentures on the same day. A partial denture can be very aesthetically pleasing, a single denture can replace multiple missing teeth hence improving the general and overall appearance. Causes no damage to the adjacent teeth. Fixed dental bridge work usually requires preparation of the adjacent teeth to support the fixed bridge. 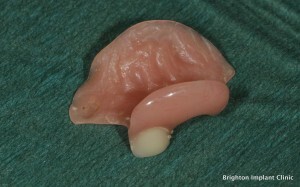 The bone where the tooth is missing will continue to shrink as the bone is not being used. Needs replacing more frequently, as the bone and tissues shrink the denture will become more loose and will require replacement. How are dental implants better than partial dentures. Dental Implants are small titanium screws that are inserted into the upper or lower jaw bone. The procedures is painless and usually takes place under local anesthetic. With larger procedures intravenous sedation can be used to make the procedure more comfortable for the patient. Dental Implants are more comfortable as the teeth are fixed and feel natural like your own teeth. Dental Implants can be used to replace a single tooth or multiple teeth. Dental Implants are more comfortable than Removable Dentures. An implant feels and functions just like a natural tooth. 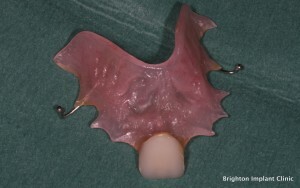 Implants will also prevent bone shrinking in the ares where natural teeth are lost. 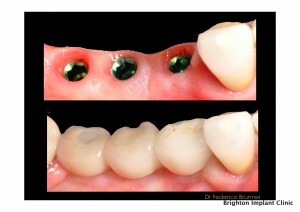 Implants will give you the confidence to eat and smile without worrying that removable dentures will move. Brighton implant clinic has three branches in Sussex based at Hailsham, Hove and Brighton. For more information about advantages & disadvantages of Partial Dentures please feel free to Contact Brighton Implant Clinic. Hi. I would like to ask , if is any discount if I want to have done 2 straight away plz. I mean 2 implants straight away. Thank you. i need a top set at least 10 teeth…can you price that for me..i live in northumberland so i would like some idea how much before i come down..